Ok, I'll admit it, I was a little afraid of the third contestant in the ice cream of the month club after my experience with Breyer's Root Beer Float. 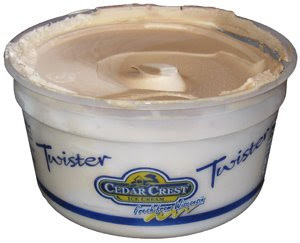 What you see before you is Root Beer Twister from Wisconsin's Cedar Crest Ice Cream. It's half root beer sherbet and half vanilla ice cream. The good news is that this is much more enjoyable than the Breyers, well, to me any way. My first couple of bites were from the Root beer sherbet. It's definitely root beer, but it's more mellow than the Breyers. What I mean is that a straight shot of this sherbet is more enjoyable than the RB sherbet/vanilla mix in the Breyers. I also appreciate the fact that it's "twisted" and not layered like the Breyers. If you needed a break in the Breyers, you just couldn't do it, you always scooped both flavors. Not so here. If I want to cleanse my palate, I can take a couple of scoops of just vanilla, and it's a nice vanilla too. Next, I can take a bite of 2 parts vanilla to 1 part root beer, or 3:1, 4:1, 1:1, it's up to me and I really appreciate having that choice. Sure the Breyers is cool looking, and great if you love root beer floats, but for those of us who don't want our taste buds smacked down with soda buzz, this is a much more pleasant alternative. Actually, now that I think about it, I just don't like swirled sherbet, I much prefer my flavors separated. I'm a big boy now, I don't need help eating my ice cream...just kidding, swirling has it's limited place. Hmmm, swirling might be the next poll question. Anyway, so this is definitely better than Breyers, but I'm guessing I'll polish off the vanilla portion long before the root beer is gone.